If you don't finish the bottle, have no fear. Pop on one of the stylish and colorful Refoc silicone wine sealer and champagne cork stoppers for an airtight seal to keep your wine and champagne fresh for weeks. ✓Each package includes 2 wine stoppers and 2 champagne stoppers, although they look almost the same, but you can easily to recognize them from the bottom. 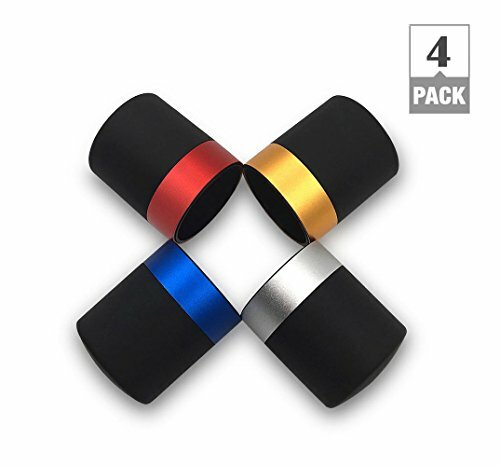 ✓The color of the wine stoppers and champagne stoppers are randomly assigned, including silver, red, gold and blue. ✓We have been upgraded product packaging to avoid the damage during the course of transportation. If you receive a damaged product, please contact us for replacement. ✓We feel sorry about that the customer bought the wrong things because we did not describe clearly, please notice that this package includes 2 wine stoppers and 2 champagne stoppers. ✓We have been updated the user manual. Please use an appropriate stopper to seal,at the bottom of the stopper, with thicker edges is the wine stopper and the thinner edges is the champagne stopper. ✓Please let us know by email if there are any quality problem, we'll help you to solve the problem and keep improving our product. That's what we do all the time. ✓Please click "Add to Cart", never hesitate. Your purchase is covered by our no questions asked return policy. ✓Thanks for your trust. We are committed to provide high-quality products and services for you. ✓ PREMIUM QUALITY: Refoc no leak wine and champagne sealer made of top quality food grade silicone, aluminum alloy and ABS. The surface is smooth and feel good. ✓WITHOUT FEAR OF LEAKAGE: The switch design that effectively prevented the stopper popping out of the bottle. Each package includes 2 wine stoppers and 2 champagne stoppers. ✓ STYLISH, FUNCTIONAL GIFT: Nice design and Ideal gift for wine and champagne lover on holidays. More focus on detail design made it upscale in the presentation. Suitable for most wine and champagne. ✓100% NO RISK MONEY BACK GUARANTEE-Your purchase is covered by our no questions asked return policy. If there are any quality problem, please contact us. We'll issue you a full refund. If you have any questions about this product by Refoc, contact us by completing and submitting the form below. If you are looking for a specif part number, please include it with your message.